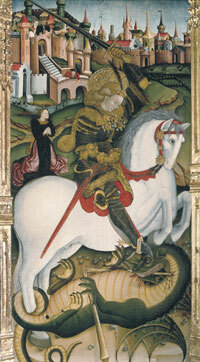 April 23rd is Sant Jordi (Saint George’s Day), patron saint of Catalonia. Although it is not a holiday, the streets of Catalonia and Barcelona fill up with people sneaking out from their jobs to find books, buy roses, and enjoy this event so typical and traditional in Catalonia. According to historical data, Sant Jordi was a Roman soldier born in Cappadocia (Turkey) in the third century and who served under the orders of Diocletian. He became a Saint because he refused to comply with the wishes of the Emperor who forced him to persecute Christians, and he was martyred and beheaded on the 23rd of April 303. But what is most known about Sant Jordi, is his legend. It is said that around Montblanc -indeed worth visiting this city that retains a great medieval architectural heritage-, there lived a dragon that terrified everyone. To calm him down, every day he was given a citizen of Montblanc, until one day it was the turn for the king’s daughter. It was then when Sant Jordi came, and fought against the dragon riding his white horse. He managed to stick his sword into the heart of the dragon, save the beautiful princess and set the town free. The legend adds that at the point where the blood of the animal was spilled, a pretty rose bush of red roses sprang. This is the reason why today, Sant Jordi has become the “Valentine’s Day” of the Catalans, and men give roses to women (to their mothers, wives, sisters and daughters, and even some bosses give one to their employees). But April 23rd is also World Book Day (declared by UNESCO in 1996) and bookstores go out on the streets to sell the books offering a 10% discount. The writers take the opportunity to promote their writings and you can see them signing and dedicating them in different bookshops. In Barcelona, the stops are centered between Passeig de Gracia, Rambla Catalunya and Plaça Catalunya. So if you are thinking about coming to Barcelona to enjoy this event, Hotel Paseo de Gracia is the ideal hotel. If you are looking for a superior hotel, also in the center, check Hotel Actual. Oh, and to all Jordi, Jorge, George, Georgina and Jordina, congratulations!